China's consumer price index (CPI) rebounded to 6.5 percent in October, matching the peak decade high in August, the National Bureau of Statistics said Tuesday. The CPI, a key gauge of inflation, grew 6.2 percent in September. Food prices, up 17.6 percent year-on-year, are the major factor behind the resurging CPI. Prices of fresh vegetables rose sharply in October, too - nearly 30 percent year-on-year. And that is a new trend. Surging prices prompted concerns that an interest rate hike might be imminent. Analysts, however, reassured the high inflation rate would not persist and instead it would slow down to become modest next year. Repercussions of a possible interest rate hike was felt on the Shanghai Composite Index, too, which fell 0.57 percent Tuesday to end at 5158. The interest rate has already been raised five times this year, but analysts widely expect the central bank to announce another hike in the short term to curb inflation. Premier Wen Jiabao visited some Beijing families on Monday to solicit their opinion over rising prices. He said options are open and the government will take all-round measures to tackle the problem. "The severe weather in some regions - floods and typhoons - may have caused the supply of vegetables to drop," said Zhu Baoliang, a senior economist with the State Information Center. Prices of meat and poultry jumped 38.3 percent and edible oil was dearer by 34 percent. 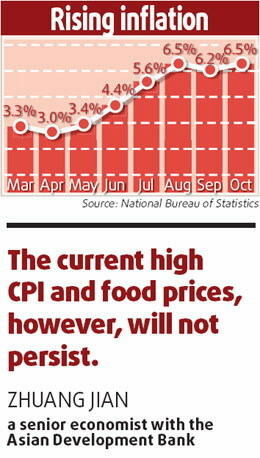 Although some food prices remain high, they have eased a bit month-on-month, showing a stabilizing trend, Zhu said. In September, meat and poultry prices rose 43 percent, while edible oil was costlier by 34.5 percent. Some economists are worried that the current trend of price rise may spill over to the broad economy, but Zhuang Jian, a senior economist with the Asian Development Bank, said it is unlikely. He, however, said prices will not drop significantly this year or the next. "The current high CPI and food prices, however, will not persist either," he said. This year may see a CPI growth of about 4.5 percent, while it is expected to be a "modest" 4 percent next year, Zhuang said. As a sign of the easing trend, analysts said, the core inflation, or the non-food price index, stood at 1.1 percent in October. The market is bracing for another interest rate hike in the short term as the CPI regained momentum in October. Shen Minggao, chief economist with the Citigroup in Beijing, said: "At least one more rate hike of 27 basis points is expected so that the gap between the one-year deposit rate and the annual CPI is narrowed... If inflation persists, the risk for more rate adjustment will rise." Although the rising interest rate for the yuan will narrow its gap with the dollar's interest rate and may bring in more capital to cash in on the expected rise of the Chinese currency, Zhuang said it's more important for policymakers to stabilize domestic inflation expectations. "The possibility of another interest rate hike, therefore, cannot be ruled out."